Vertical bulkheads can divide your swimming pool in two areas. A vertical bulkhead allows you to divide the pool into half from one fixed location in the swimming pool. The bulkhead is operated by the pool staff via a touch screen. The entire bulkhead can be submerged into a sunken recess in the swimming pool floor. All the vertical bulkheads of Variopool are available in one-, two- and three piece versions, increasing the number of possible configurations. 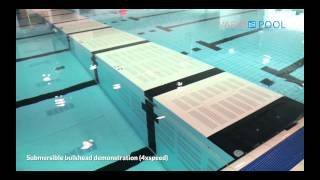 The bulkheads are powered by a hydraulic system comparable to the ones we use for movable swimming pool floors. The bulkhead is operated by a hydraulic system that you can compare with the same system as a movable floor.